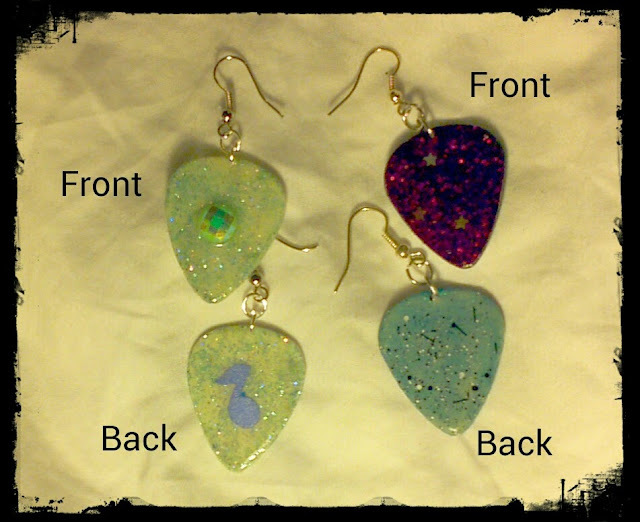 I've been having a BLAST making glow in the dark guitar pick earrings! I recently got some glitter polish on sale and made some brand NEW stuff! The first pair on the left glows brilliantly in the dark, one side with a purple music note, the other side is a green black light reactive gem. The second pair on the right features super glam purple with stars and glow in the dark with speckles on the back side. I've tested them in the dark and with black lights to really make sure they are vibrant and fun. These pairs are brand new and not posted in my store!